Do you remember the song, “Nobody likes me… Everybody hates me… I’m gonna eat some wor-rr-ms…”? When I was feeling sorry for myself as a kid, my Mom used to try to cheer me up by singing that song to me. I guess she was attempting to make me realize how silly and trivial I was being. It usually worked. But still, I just couldn’t get past the thought of eating worms. And then there was the book we read back in elementary school, “How to eat fried worms” The title alone completely repulsed me – I couldn’t even get through the entire book (just too many horrifying descriptive worm-eating depictions. ) So, when I was thinking about making a gross Halloween dessert, worms immediately sprung to mind. For the last couple of years, we’ve had a contest at our Halloween potluck at work with a prize for “best Halloween themed food.” This year I was determined to put in some real effort and win that prize! And since the grossest looking entry (the kitty litter cake) won last year and my cute little Phantom Perogy Pizza Pops just didn’t cut it, I decided to go for repulsive this time round…. 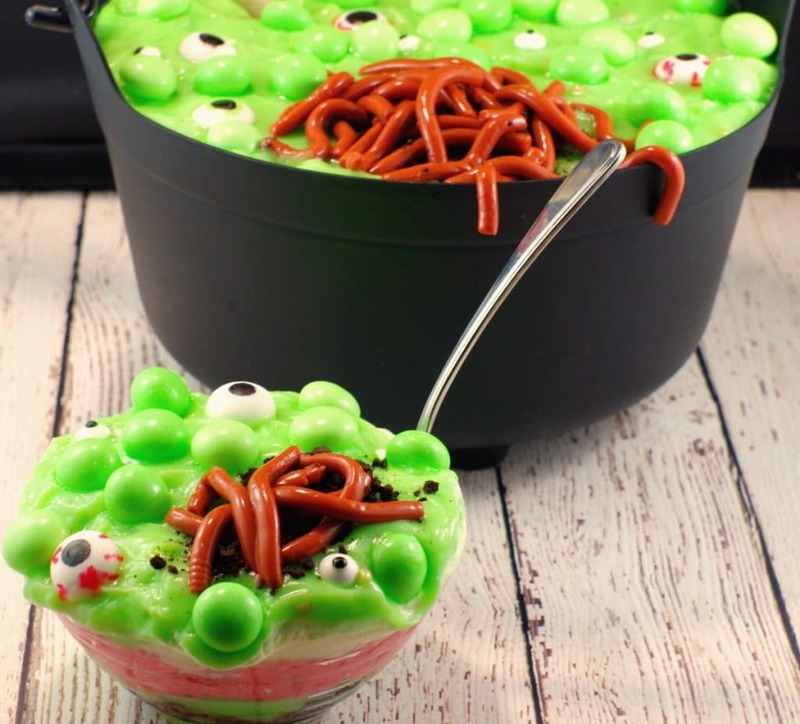 A witches brew trifle with worms, dirt, and eyeballs was sure to garner some revulsion! Have you ever made anything that looks too gross to eat? As a cake decorator, food blogger and food photographer, this really goes against my grain, with my goal consistently being to make food look mouth-watering! So, creating something that looked disgusting was a bit of a stretch for me. However, it’s one thing to make something that looks cool and creepy, but it’s an entirely different thing to make it taste good as well. But this spumoni trifle is the best of both the spooky, cool-looking and delicious worlds. If you are looking for Halloween potluck ideas for work that actually taste good, then this is your Halloween dessert! 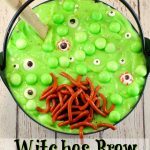 And although this witch’s brew dessert recipe is a Halloween dessert, it’s also perfect for a scary birthday party or oddly enough, a spring garden theme party. Seriously. Layer it in a clear trifle dish and you have yourself a spring colour themed trifle, complete with worms! 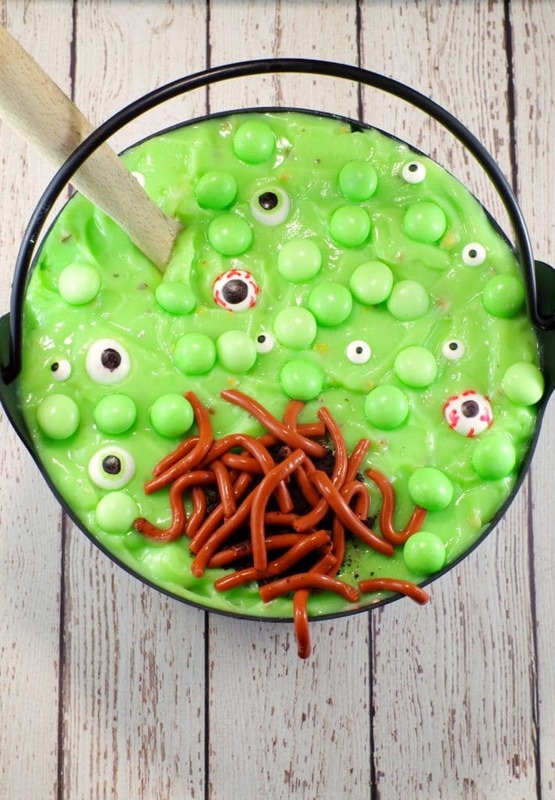 Just skip the eyeballs and bubbling cauldron mint toppings, add a gardening tool and you’re good to go! The worms take an investment of prep time, but they are well worth it if you are going for that gross look. In fact, I consider them the crowning glory on this Halloween trifle. In the end, I did win the “best Halloween food” at the potluck this year and scored an excellent foodie prize – a restaurant gift card! At least I don’t have to feel sorry for myself and go eat some worms. But I think I will anyway- they really are delicious! Happy gross, scary, spooky cooking!! If you are looking for more Halloween potluck recipes, then give this Melting Witch Halloween Chocolate Bark a try! 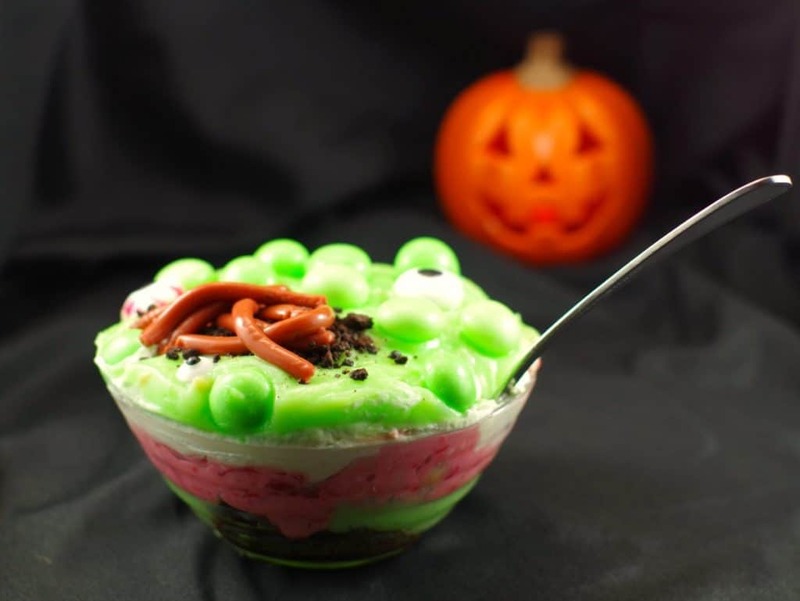 This Witches Brew Spumoni Trifle is the perfect dessert for your Halloween potluck. 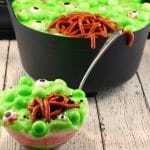 A trifle consisting of layers of cake, pistachio pudding, whipped cream and cherry almond cream cheese, topped with mint eyeballs, bubbles and jello worms, this dessert is both scary -looking and delicious! Make pistachio pudding, as per package instructions. Beat whipping cream to soft peaks and then add white granulated sugar. Beat to stiff peaks. Assemble: break the cake up and put in bottom of cauldron or trifle dish. Add 1/2 the pistachio pudding, then top that with cream cheese cherry mixture. Add all the whipped cream, then top with remainder of pistachio pudding. Add boiling water; stir until gelatins completely dissolves. Chill until lukewarm in fridge, about 20 minutes. Meanwhile, gently pull straws to extend to full length; place in tall container. Wrap together with elastic and cover bottom with saran wrap/food safe wrap adn then cover with masking tape. Pull straws from container (if using a carton, tear carton away from straws). Pull straws apart; run hot tap water on the sides of the straws for about 2 seconds over 3 to 4 straws at a time (ensuring to keep water away from the inside). Remove saran wrap and tape. Starting at the empty ends, push worms from straws by gently pushing them out of the straw. Lay worms on parchment paper-lined baking sheets. Cover and chill until ready to use, at least 1 hour, but up to 2 days. Worms will hold at room temperature up to 2 hours. Add green mints and small candy eyes and eye mints to the top of the trifle. Add a little oreo cookie crumbs under the worms and sprinkle a little on top, if desired. Serve. *Note: if mints are left on the trifle the mint flavour will seep in to the dish . If you like mints, then you can put them on in advance. If you do not like mints, then put them on just prior to serving! I’m so glad you won the potluck contest this year! These trifle is definitely spooky and I can’t stop looking at those worms but I’m also super excited to make it next year. Hi Charlotte – Thanks! I hope you enjoy it when you do get a chance to make it! The worms add that nice gross touch. Definitely worthy of the win. This is so creepy and fun! I just featured this recipe in my Halloween Foods roundup on my blog! Thank you 🙂 I’ll check it out!